Devi, the Mother Goddesses, would be wakened up ‘Palliyunarthal’ at 4 in the early morning followed by opening of the door of ‘Sreekovil’ (Sanctum Sanctorum), ‘Abhisheka’ (divine bath), ‘Malar Nivedya’ (Pop-rice offering). 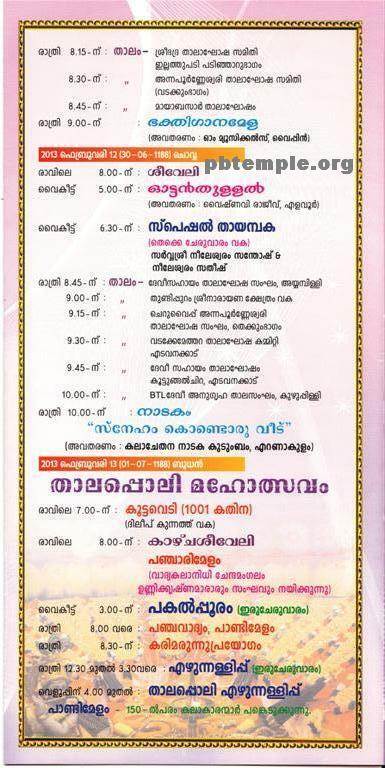 ‘Usha Pooja’ (early morning pooja), ‘Ethrithu Pooja’ (pooja offered at the time when sun comes in straight line with the idol), ‘Ucha Pooja’ (noon pooja, though performed at about 10 am) accompanied by the offering of ‘Athimadura Payasam’ (double sweetened pudding) after which the doors of the ‘Sreekovil’ will be closed. The ‘Sreekovil’ will be opened only by 5 pm followed by ‘Deeparadhana’ (showing lighted ghee lamps and camphor at the end of pooja session at dusk). It is always a blissful experience to watch the Devine Mother bathed in the aura of lighted lamps at twilight. On all days except on special occasions, doors of the ‘Sreekovil’ will be closed after offering ‘Athazha Pooja’ (Supper Pooja) at 8 pm. But on special occasions such as on the day of ‘Bharani’ (Bharani Star) on each and every month of the Malayalam Calendar, known as ‘Kolla Varsham’ and on festival seasons special ‘Poojas’ will be offered. 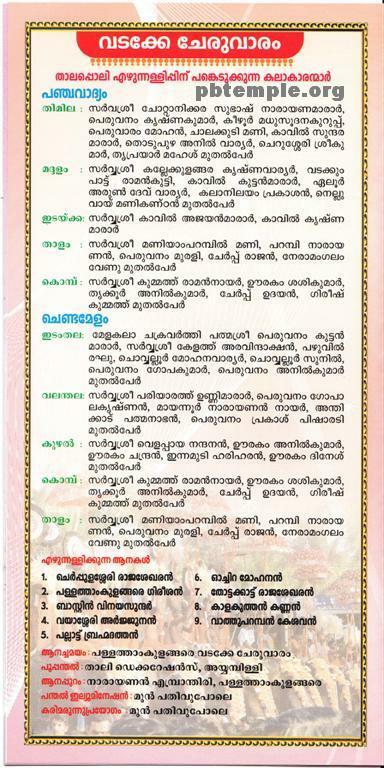 Especially on the 10th day of the Malayalam month, ‘Medam’ the esoteric ‘Gurusi Pooja’ is performed (offering the red mixture of water made from adding lime and a few other items to turmeric powder). ‘Gurusi Pooja’ is performed in lieu of the ancient practice of ‘Guruthi’ (ritual sacrifice) to the Mother Goddess. 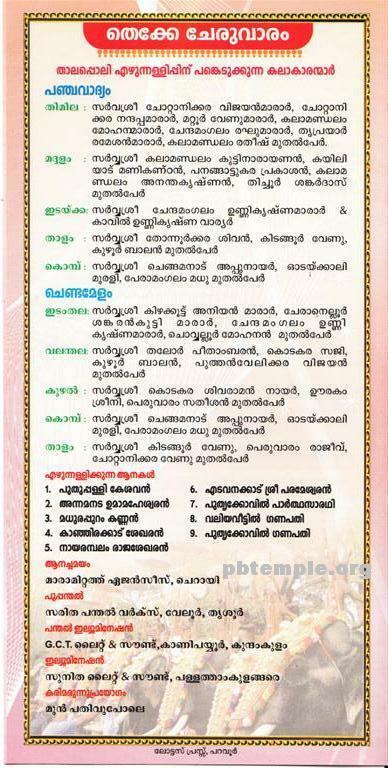 Though traditionally ‘Thanthram’ of the temple vests with ‘Kootalakkadu Mekkadu Mana’, but, now the present ‘Thanthri’ (the deemed father of the deity) is ‘Brahmma Sree Krishnan Namboothiripadu’ of Vezhaparambu Mana, Manakkappadi, N.Paravur, Ernakulam District. 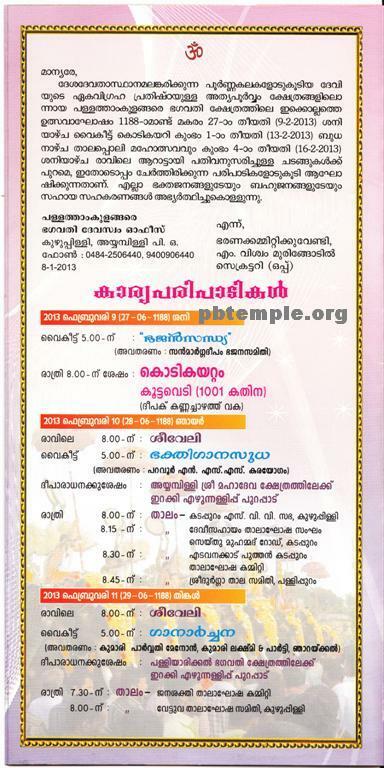 Karanavar (senior most male) of ‘Vayalil’ family is the customary oracle of this temple.